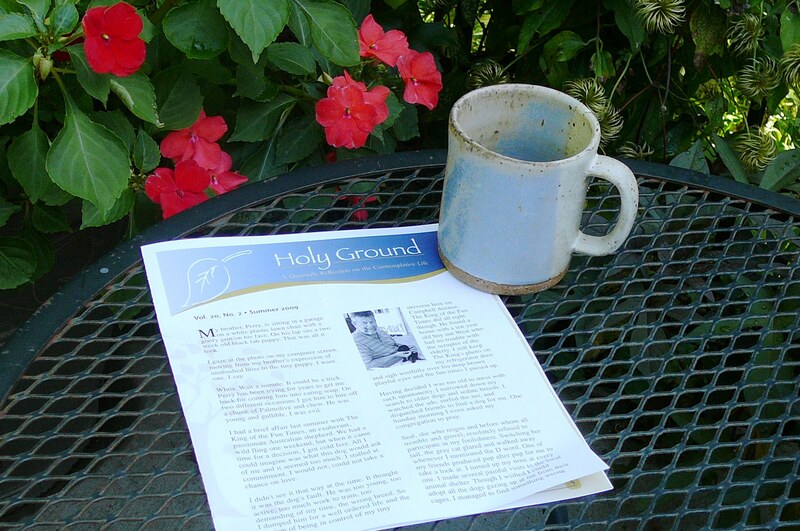 Holy Ground, a quarterly reflection, serving up spiritual food that sticks to the ribs for twenty three years. Back issues of this little newsletter can be found in every stack of papers in my house – I move them from my desk to the kitchen counter to the pile of mail on the dining room table, until they eventually become dog-eared and fall apart. I just can’t seem to throw an issue of Holy Ground away. Why? Because Loretta Ross, an ordained Presbyterian clergy woman and a fine writer, puts equal amounts of inspiration and whimsy into every issue. Even though Holy Ground is a thin little folder – 7 or 8 pages, one essay, really – it’s always refreshing, renewing,; an awakening of sorts. I want to thank you for all your support, shares, comments, follows, and subscriptions to the Praying Life blog over the past three years. You continually call me to deeper truth, deeper prayer, and better writing. You are each a gift in my life. Here’s the deal: Subscribe to Holy Ground and get the first two issues of a new series of issues on contemplation FREE! Before I started writing the Praying Life blog I had been publishing a quarterly reflection on the life of prayer called Holy Ground for over twenty years. In 2000 Sheed and Ward published the best of those essays in the book, Letters from the Holy Ground –Seeing God Where You Are. I occasionally feature excerpts from this book here. Who are you really and why should I invest in a subscription to Holy Ground, even if I get two free copies? Many of the subscribers of Holy Ground have been reading this little publication since its beginning. The writing in Holy Ground is similar to what you find in my blog here, except that each essay is a lengthier consideration of some aspect of our life in God. Many Holy Ground issues make their way to Bible study classes and prayer groups. As with The Praying Life blog, the writing is informed by my thirty years of listening deeply to the stories of others about their faith lives. As a spiritual director I have spent thousands of hours listening and learning of the struggle, the suffering, and the beauty of growing in the likeness of Christ. My ministry as a pastor, as well as personal study and training in theology, scripture, and faith formation also shape my understanding of the church in this tumultuous time. I am accountable to a Board of Directors, a member of Spiritual Directors International, and an honorably retired member of the Presbytery of Northern Kansas. I take very seriously the access others give me through my writing and seek to be held accountable by other professionals and my church. Finally and most important, is my commitment to prayer. Setting aside a day of solitude and prayer weekly, is the only credential I offer of any lasting value. For twenty five years I have focused my ministry on prayer first, last, and always. This is the core of who I am. In the words of Oswald Chambers, “ I am called to live in such a perfect relationship with God that my life produces a yearning for God in the lives of others, not admiration for myself. … God’s purpose is … getting me to the place where God can use me. Let God do what he wants.” My Utmost for His Highest. For me prayer is the process of continued surrender into the will of God. I am not my own, but belong to One greater than I, whose purposes for me I generally resist, but ultimately seem to surrender to. This new series of Holy Ground issues is on Contemplation and the first issue of the series, which you get free with our offer, is a general overview of contemporary contemplation and a consideration of several definitions of this somewhat obscure word. The second issue of the series, which you also get free with our offer is a long, loving look at what it means to pay attention. One learns a lot from the disciplined practice of the present moment, or mindfulness, as it is sometimes called. As I watch the fleeting shadows of my mind’s picture show, I encounter my restlessness and my estrangement from my deepest self, where Holiness abides. Day after day my ego strides with a flourish to its pulpit to justify, defend, or convince imagined audiences of its own certainties. Persistent and untiring, it plants its elbows on the podium and tightly grips the sides. Posturing and pontificating, it attempts to prevail against the horror of its diminishment and disappearance in the embrace of what is beyond our naming. We sit still as stones as love stalks us, waiting just beyond the edges of our awareness to pounce upon its prey and carry us off between its teeth into the divine depths of each moment. . . . . The past thirty five years we have seen a tremendous growth and flourishing of contemplative practices world wide. Understanding and appreciation of contemplative prayer have grown in many faith traditions. The hunger for communion with God and the development of the spiritual aspect of our being has spilled out from churches, synagogues, mosques, and temples to PBS special documentaries, internet, coffee shops, retreat centers, and hundreds of programs in faith formation world wide, as well as secularized versions in business and the sciences. 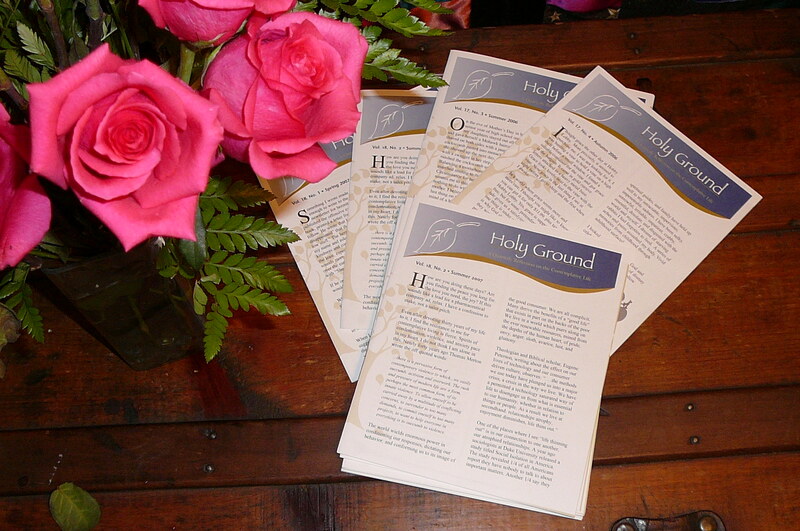 By subscribing to Holy Ground, you will get more encouragement for your journey. A year’s subscription is $35.00, which with our offer includes six issues, instead of the usual four. That is a 50% savings. Subscribe today. Click here. You will soon will receive in your email copies of the first two issues in the series on contemplation. You will be glad you did. And you will help us keep offering serious rib stickin’ soul food. If you would prefer the printed snail mail version, check that option in the drop down box and we will get your free issues in the mail right away. If you have any problems or questions, leave a comment here, look for the facebook page The Sanctuary Foundation for Prayer, or email me at lross@fromholyground.org. Again, dear ones, thank you from the bottom of my heart for carefully tending to your own souls and including this blog in your diet. If you already subscribe to Holy Ground, thank you so much! How about giving a gift subscription to a friend, or passing this post on to someone you know? Holy Ground essays sustain long after the rise and fall of scandal, political wranglings, and the garish blare of media sound bites. Holy Ground. goes great with a cup of coffee! This entry was posted in Christianity, Special Offer, Spiritual Direction, Spiritual Formation, The praying life and tagged contemplation, Free issues, holy ground, Prayer, Publications from The Sanctuary Foundation, Special Offer, Spiritual reading, spirituality. Bookmark the permalink.